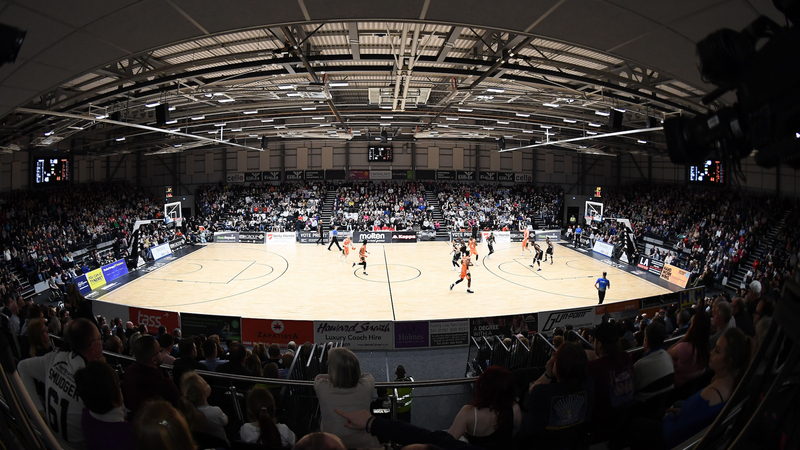 Today’s guest writer is Simon Bird, a North-East based sports writer for the Daily Mirror, who attended our arena opening game against Plymouth Raiders last Friday night. Take your seat at the new Eagles Community Arena for the first time and you are struck by several emotions. It feel intimate, close to the action. It’s noisy, passionate and you feel right at the heart of the action. It’s everything a home court should be. 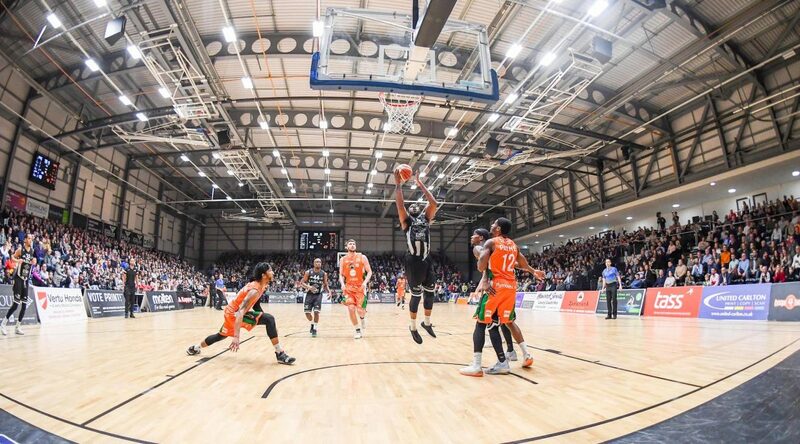 Opening night saw Plymouth Raiders help christen the new court. There was few signs of the frantic rush to get the place ready as 2,800 people saw Darius Defoe score the first points. As the game progressed, the Eagles scrapping hard against a determined Plymouth side, I looked up at the new roof. 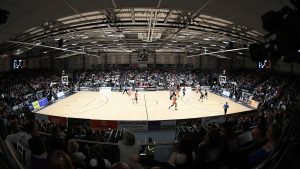 The elite men were playing on the pristine court, in front of a full house, in a home of their own, which one day could mean European level basketball comes to Newcastle. But in the rafters was evidence of another huge step forward that basketball in making in the North East. Away from the British Basketball night, the seat push back into the wall, and the arena is transformed into a basketball centre for all. On a Saturday the place is packed out again… with kids of all ages, playing in the central venue league. Kids, from 10-18, getting their first taste of team level hoops. They’ve been hooked into basketball by Eagles Community Foundation coaches who visit schools around the North East creating mini-clubs on their doorstep. So elite Eagles one night. Hundreds of kids the next. Kids getting fit, being healthy and loving sport, all because of the Eagles community work. Look carefully and you’ll see eight courts can be squeezed in to the space. Or three if they want more room. That’s how it looked when my daughter trained with the girls U14 academy squad the following week. That’s the next level up from the CVL, kids making the huge strides improving their game, getting intensive, expert coaching and playing clubs from around the North, as far afield as Manchester and Derby. Girls and boys. 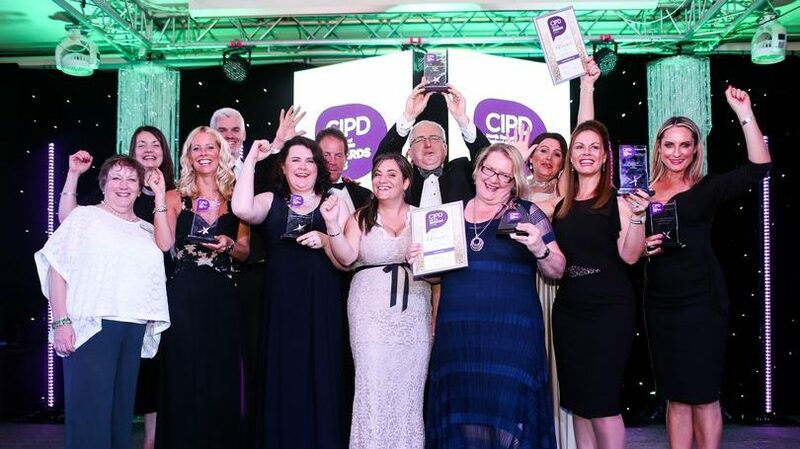 All those teams, previously scattered around various sports halls, also now have a home. At half time on opening night the Fab Flournoy’s men were in a real battle – 50-49, with Defoe top scoring on 17. By full-time it was a narrow, but exciting defeat. 86-91. It wasn’t what Fab wanted. He’d made an emotional pre match address to sponsors before the game eloquently showing what the Arena means to the Eagles. But there will be many victories ahead for the first team. And the women’s senior team which fans can also come and watch here. 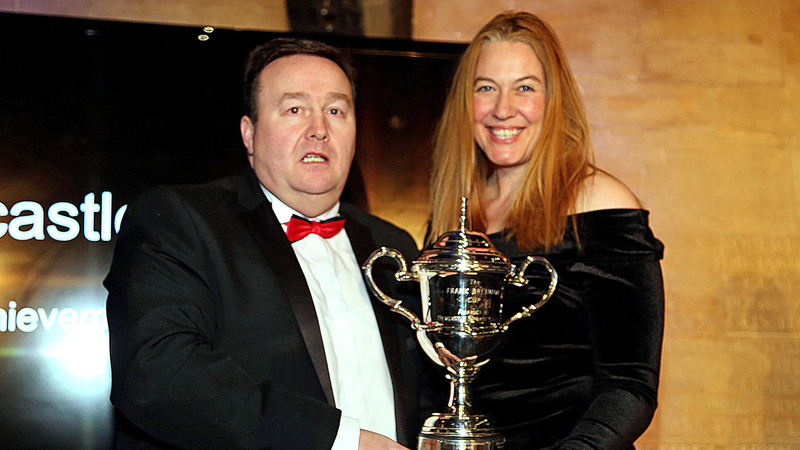 The greatest victory has already been won by owner Paul Blake and his team. A new home has risen out of land in Scotswood, Elswick. It’s been years in the planning, and the legacy will be felt by elite level basketball and down the ranks, for decades to come. Get down there and support Newcastle’s most successful sporting club. You’ll enjoy the speed, skill, athleticism and atmosphere.